If Emma Watson can do it, so can I. So after Emma’s year in books, here are my ten best reads of 2016. Be forewarned, these are not the best new books of 2016, but my favourite reads of the year, meaning some of these go back quite a while. My friends know I read a lot and I am often asked about book recommendations which, given the inevitable subjectivity of such an exercise, I hesitate to do. Don’t want to lose friends over such trifling matters. With this in mind, here are my favorite reads of 2016 in the order in which I read them. Constable in Love, Martin Gayford, 2010. John Constable (1776–1837) is one my favorite painters. Whenever I am in London, I try to go and visit the museums that display his masterpieces. There are also some really nice watercolors at the Fitzwilliam in Cambridge. Gayford’s book was a nice intersection of my interests in Constable and in biographies. It concentrates on Constable’s courting and relationship with his wife-to-be Maria Bicknell – it breezes through the rest of his life – and on his budding career and learning of the trade. The book was also a fascinating way to learn about life in England and London in the early 19th century and the arts trade at the time. A definite recommendation it you are interested in Constable and the art world. This book is really a combination of different genres including biography, social studies and commentary and history. I like Didion’s style. I used to live in the USA and have seen extensive parts of it, but I have never made it to California. This was an interesting way to discover the history of California besides benefiting from Didion’s trenchant observations on American life. Not counting what Didion chooses to unveil about her life, she reminds us that despite the Americans’ distrust of Big Government, much of the USA would be quite different without Government subsidies. Though I have read many American Classics, I had never read Mark Twain. The book needs no introduction. There are reasons why classics are classics. Having lived in the South, I found that Twain’s writing still resonates with the South today. Well worth its place in the American Pantheon and in the list of books to read if one wants to get a better grasp of the culture and history of the USA. This book had been lying around for years at my in-laws in Atlanta. In 2016 I decided to deepen my knowledge of the US Independence period, so in the summer I finally tackled this brick. Hamilton was a captivating character of the Independence and post-Independence period. Though I wish some of the material had been shortened in the editing process, the book is an illuminating introduction to Hamilton and his historical context. Having read the first volume of Moore’s biography of Thatcher, I had planned to follow it up with John Major’s autobiography. After finding Major’s book for sale in perfect shape at the public library in Atlanta this summer, I had my chance. What struck me in this book was Major’s insider’s view on how the EU had proved to be a major subject of controversy in his days, after already having been a headache for Thatcher. I wonder if Cameron has ever read this book. Translated as “A Balcony in the Forest”. Julien Gracq was a major if somewhat out of the limelight twentieth century French author. He is one of the rare writers to be published in the prestigious collection of the Pleiade while still alive, but Gracq is not an easy author to read. His vocabulary is considerable. Both “Un balcon en forêt” and the more famous “Le rivage des Syrtes” (The Opposing Shore) focus on what precedes coming hostilities. In the case of Balcony, this refers to the German invasion of Belgium and France in 1939. A serene and beautiful text. This is the fifth volume of “À la recherche du temps perdu” (“In Search of the Lost Time” or “Remembrance of Things Past” in English) and is translated as “The Prisoner” in English. Someone once said that in the life of a reader, there is a before Proust and an after Proust. It definitely was the case for me. I tried reading Proust in my thirties but somehow did not get into it. I gave it another go in my forties and got hooked. I am now on my second reading of the “À la recherche du temps perdu”. You either like Proust or you don’t — as is the case with any author, I guess. My favorite volumes in the series are the first two and the last one, where the episode of the Madeleine comes back and Proust offers some of the best pages I have read on what it means to read a text. 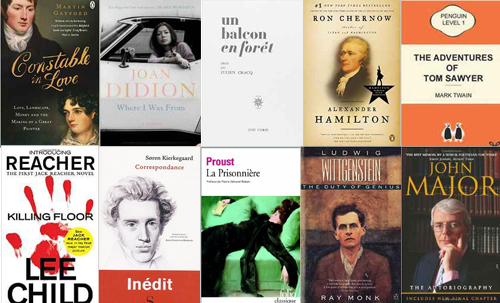 ‘La prisonnière’ is not my favourite of the seven volumes in French, but it still was one of the best books I read in 2016. I read this book in the early nineties and decided to slowly reread it through 2016. Together with Kierkegaard, Wittengstein is my favourite philosopher. I don’t agree with everything he says, provided I actually understand him, but he makes me think about language and how we apprehend the reality we live in. This is one of the best biographies I have read, but it might be a tough read if you have never read Wittgenstein. A must if you have any interest in one of the most important philosophers of the twentieth century. I have been reading Kierkegaard for many years. I even wanted to name my son Søren. For reasons that I cannot fathom this brilliant idea was vetoed by my better half and other friends and relatives. This book was given to me in 2003. I read it back then and decided to read it again through the past year. Fascinating insights into the life of this enormously influential philosopher who shares many biographical and theoretical parallels with Wittgenstein. I have not had a look at this volume in English, but I suppose it is the equivalent of the French volume. A totally different genre. I usually read several thrillers or detective books on vacation. I discovered the Jack Reacher series this year and read several volumes during the summer and the Christmas vacation. As is often the case with this genre, especially in the US (I know Lee Child is English but these are definitely of the US variety), the hero is mentally and physically a superman. Overall, I really enjoyed Reacher’s adventures, even though some of the volumes could easily have been shorter. H. is for Hawk, Helen MacDonald, 2015. 2017 is my German year. I’ll focus on German history, politics, culture, etc. I have started Germany: Memories of a Nation, a creative way to introduce Germany. You can download the original BBC episodes. On to next year’s list then! An interesting mix of reading. Read on! A voracious and deliciously eclectic selection!